In front of a home crowd at the Uiam Ice Rink, the Koreans (Skip Hak Sung Kim, third Seoung Won Jung, second Mi-Suk Kang and lead Byeong Il Noh) took their only point of the game in the first end. From then on, the Russians, (Skip Andrey Smirnov, third Marat Romanov, second Aleksandr Shevchenko and lead Svetlana Pakhomova) took advantage of missed shots by their opponents to win the game. In the third end, Russia stole three points when Kim was heavy with a hit and roll and rolled out of the house. In the fourth end, Kim’s last stone hit a guard and gave the Russian’s another two points. The Koreans shook hands at the end of the seventh end, giving Russia the 2012 title. The Bronze medal game was between China (Skip Haitao Wang, third Wei Liu, second Guangqin Xu and lead Qiang Zhang) and Slovakia (Skip Radoslav Duris, third Branislav Jakubec, second Dusan Pitonak and lead Monika Kunkelova). The outcome of the game was virtually decided in the fifth end when the Chinese stole three points and led 7-2. The Slovaks played on until the eighth end, picking up a further two points in the seventh. With the score at 7-4, Slovakia needed four points for a win or three points to tie. With a chance for the tie, Slovak Skip Radoslav Duris tried to bury his first shot behind two Chinese guards but ended up out in the open. Chinese Skip Haitao Wang made a take out to seal their 7-4 win. “We think we played quite well in seven of the ends, but when we lost three points, this end ultimately led to the final outcome,” said Slovak Coach Frantisek Pitonak. 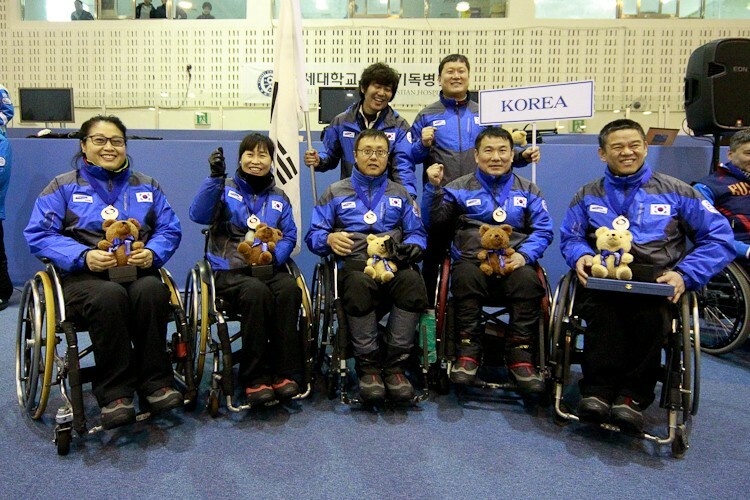 Hak Sung Kim, Skip of Team Korea, was awarded the 2012 World Wheelchair Curling Championship Sportsmanship award. Kim was nominated by his fellow competitors. They were all invited to nominate a player at the event who, in their view, best exemplified the traditional values of skill, honesty, fair play, sportsmanship and friendship. * teams are ranked according to their win-loss record against each other at the event. 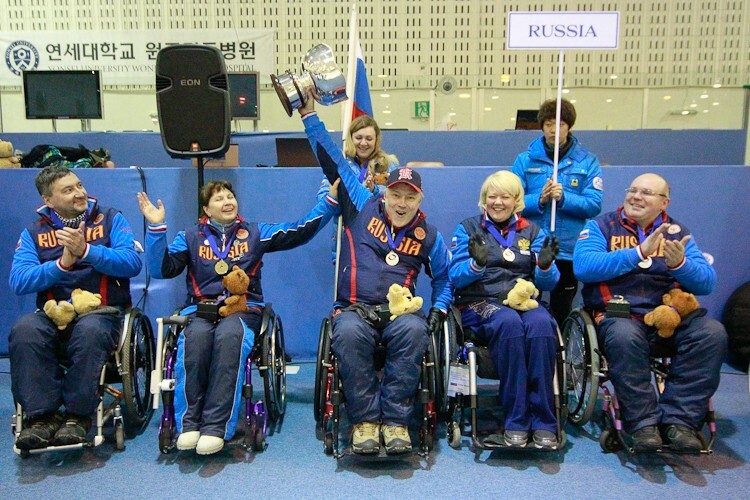 Korea, Russia, China, Slovakia, USA, Sweden, Canada and Scotland have all secured a place at the 2013 World Wheelchair Curling Championship which will take place in Sochi, Russia from 16-23 February. 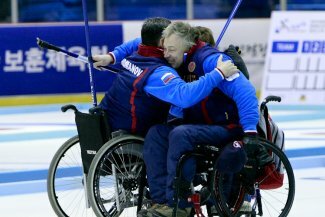 Norway and Italy are relegated to the World Wheelchair Curling Qualification event which will be staged at the Kisakallio Sports Institute in Lohja, Finland from 27 October to 3 November 2012. The top two teams at this event will gain entry to the 2013 World Championship in Sochi. Russian Skip Andrey Smirnov has been part of the Russian Wheelchair curling team since 2004. The 38 year old from Yekaterinburg began to skip in 2005. His highest place finish prior to this championship was fourth at the World Championships in Prague last year losing the bronze medal game to Norway. Korean Skip Hak Sung Kim first skipped a Korean team at the World Championships in 2004 in Sursee Switzerland. His best World Championship performance ahead of this Championship was a silver medal finish in 2008, once again in Sursee. He followed that with a Silver medal in Vancouver at the 2010 Paralympic Winter Games. While Korea competed at last year’s world championship in Prague, it was not Kim’s team that represented their country. Kim who celebrated his 44th birthday at the championships on Thursday is from Wonju. 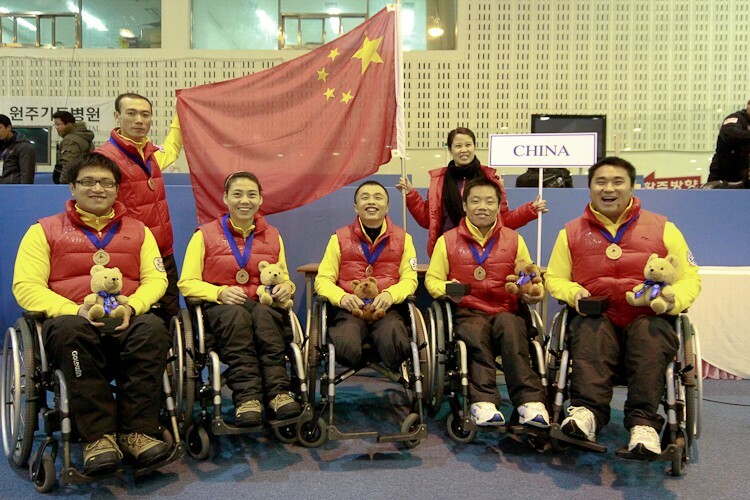 21 year old Chinese Skip Haitao Wang and his team started competing at international level in 2008 – winning the World Wheelchair Curling Qualification event to get to the 2009 World Championships in Vancouver where they finished 8th. With not enough points make it to the Paralympics in Vancouver in 2010, they had to qualify for the World Championships again. Wang, who comes from near Harbin in China’s Heilongjiang Province, and his team won the qualifier in November 2010 to get to Prague for the World Championships in 2011 where they finished 5th. For Slovak Skip Radoslav Duris and his team, this is their first World Wheelchair Curling Championship appearance. His team won the qualifier event in Finland last November. 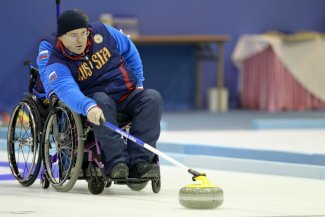 Curling was introduced in Slovakia ten years ago, with wheelchair curling beginning in 2007. 37 year old Duris comes from Dubnica. The 2012 World Wheelchair Curling Qualification event will now take place at the Kisakallio Sports Institute in Lohja, Finland, from the 3-8 November 2012.